Thank you to all who enquired or had a look at the coaches. 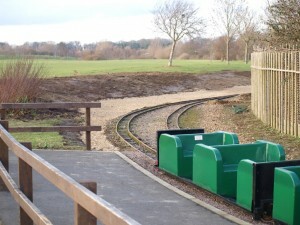 Ferry Meadows Railway. Coaches for Sale 10.1/4” Gauge. These coaches are still for sale and must go soon, make us an offer before we are forced to dismantle them for parts and scrap, with a bit of minor work they will serve somebody very well as they have done for us for over thirty years. Our set of green coaches are now up for sale, having been replaced last year by the covered set that we refurbished. They have been our main set for over 30 years and must have carried hundreds of thousands of passengers in that time. The set comprises of 6 coaches in two sets of 3, each set carrying 32 people, by moving bogies around you can have 1×6 to carry 64 or 2×3 to carry 32 each or 1×4 to carry 44, or a very short set of 2 to carry just 20 people. The whole set is in need of striping down and repainting, the last time they were painted was 3 years ago, the chassis are steel box and the seats are made of fibre glass (whoever buys the coaches will get the mould to make new seats) the bogies are lightweight and some of them have new wheel sets and bearings (the new wheel sets where only run for 2 seasons). The coaches will be sold as a complete set, we will not split them unless we have 2 interested parties. Offers in the region of £2.500 for the lot, buyer to collect from Ferry Meadows. We can arrange transport at the buyers cost. Please email david@ferrymeadowsrailway.co.uk if you are interested. If you type “Ferry Meadows Railway” in to Youtube you will find loads of videos showing the coaches, here is one to take you there.